Locals formed the Boating Club here at this site in 1925. The first clubhouse was completed in 1929 and the land was bought in 1942. During WWII the army occupied the building for coastal defence. The Club continues to be an integral part of the community. Karehana Bay grew in popularity during the 1920s. Sections were sold and homes and holiday baches built. The number of keen sailors increased. 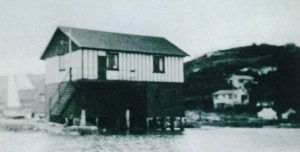 The Paremata Boating Club formed in 1924. 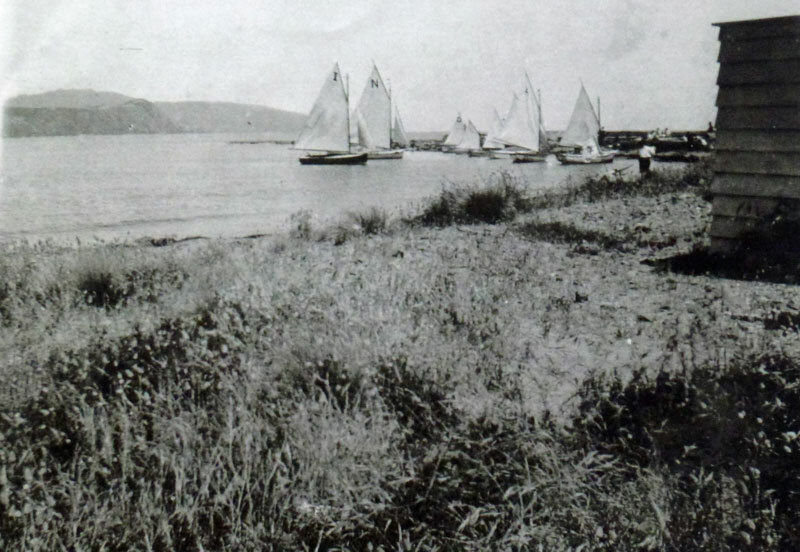 On 4 April 1925 a meeting was held in the dressing shed on Karehana beach to discuss the reorganisation of the Paremata Club or the creation of a club at Plimmerton. A resolution was taken that Plimmerton would form its own club. At a meeting in May the general and sailing rules and the club burgee, a red diamond on a white background, were adopted. Henry France* and A Stirling were voted life members. The Club’s trustees signed a lease with land owners George Troup and Charles Moore for The Point at the north end of Karehana Bay. This lease was extended over time until 1942 when the Club bought this land from George Troup’s estate and Charles Moore. They paid the princely sum of £275 ($550). This was very generous on the part of the vendors since the government valuation at that time was £695 ($1,390). When the Club first began operating, a Slip Owners Association controlled a launching slipway on the site. After a series of meetings matters were sorted and the Club settled into the business of yachting. From the beginning the Club held racing only on Saturdays, in line with the views of some of its founders. It was another 50 years before yachting occurred regularly on Sundays. 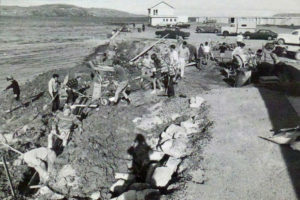 Building began on the first clubhouse in 1929, with bank funding guaranteed by the 11 people who attended the formation meeting, each to the tune of £50 ($100). With this financial largesse, as well as contributions of materials and voluntary labour, the clubhouse was ready for use when the new season began in September of that year. By 1933 the Club had gathered sufficient funding to pay off the bank loan. A few years later club members won the Wellington trials of the Sanders Cup and competed at the National event in Auckland. It was that year that the sailors wore the first Hutchwilco life jackets – wonderfully warm and smart but not such good lifesavers as they were filled with kapok. For several years during WWII the clubhouse was taken over by the New Zealand Army for use as a base to keep watch for a Japanese seaborne invasion. About 20 soldiers were stationed there. Several boatsheds had to be removed to make room for a gun pit placement and other defences. The Army set explosives under the clubhouse and slipway and was ready to destroy them to ensure visibility from the pillbox on the beach behind should Japanese appear on the horizon. Since their presence had a major effect on the functioning of the Club, the Army agreed to pay a weekly rental of £1.10s ($3.00). After the war, and with the return of the servicemen, yachting enjoyed a revival. Bill and Ivan Casey won the Wellington Championship in their Z class yacht, while Gordon Ward won the P Class Wellington Provincial Trials. Boating Club opening day in the 1950s before the seawall was built. 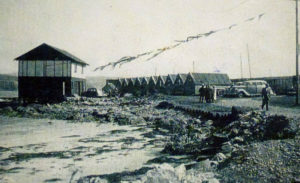 Army huts are converted to boatsheds. Flags are flying on the line. More boatsheds were needed. The Club bought 12 Army huts with a loan from Mr H D Dodson, and built a few more. In 1949 a suitable boat was acquired for pick up and general rescue work. It was named the Deryck Barron for the only member who lost his life in Navy service during the war. In 1946/47 Plimmerton ran Queen Carnivals as fund-raising ventures for local organisations. The Boating Club and three other groups had Queen ‘teams’ and the one which raised the most money was crowned at the Theatre Royal. In 1947 the Boating Club Queen, raised £250 ($500) and won the title. A seawall was built of 44 gallon drums filled with sand and rock to protect the southern side of The Point. Unfortunately this did not stand up to the sea for long and by the 1960s a series of working bees was held to build a new wall. The clubhouse were completely remodelled and reopened in 1965, making it suitable for public events. About this time new and larger boatsheds were needed and built progressively over the following years. Again in the 1970s the clubhouse was substantially remodelled and a new jetty and retaining wall completed. A new rescue boat was purchased in 1974. The following year the Club celebrated its first 50 years. There were more festivities in 2000 for the 75th jubilee. The Club has continued to grow and improve its facilities with its Clubhouse regularly opened for public events.